If you thought South Sudan was the world’s youngest country, you’re behind the times. Last week, a man walked out to an unclaimed seven square kilometer parcel of land tucked along the Danube between Croatia and Serbia, ran up a flag, and proclaimed the establishment of a new country: Liberland. Now tens of thousands have signed up for citizenship.The little nationlet started out at a stunt of sorts dreamed up by its founder — now President — former Czech Vit Jedlicka. A member of the libertarian, euroskeptic Party of Free Citizens in the Czech Republic, Jedlicka sought out the little bit of land as a form of political protest. It’s an area that has been contested by both countries and has therefore remained unclaimed. Once Jedlicka floated the idea, it gained quite a lot of momentum and support, and now the country has a flag, a coat of arms, a motto (“live and let live”), a facebook page, several Twitter accounts, and a website complete with attractive stock photo people. The original group of nation-founders set out to round up 5,000 intrepid pioneers to come make the new green, libertarian Utopia. And they’ve received about 250,000 responses so far. Yup, people are already calling it the World’s Newest Tax Haven. Liberlanders hope to set up server farms, maybe a stock exchange, the lightest of business regulation, and definitely no taxes, Jedlicka told Vice. “The key idea is voluntary taxes, creating a state so small that there’s almost no state,” he told AFP. 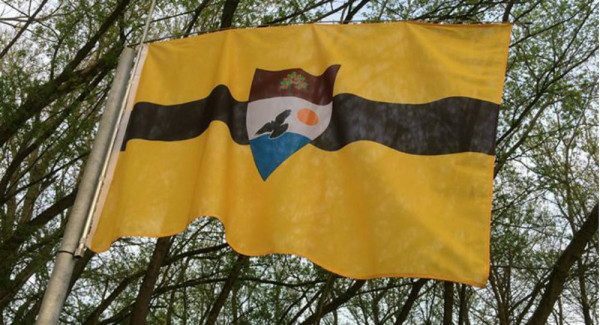 Another post reminds future citizens/investors that “Liberland will be one of only 6 countries on the world without national debt” along with Macao, Palau, Liechtenstein, Brunei and the British Virgin Islands. While Liberland sets up informal embassies in Canada, Germany, the Czech Republic and Serbia, it’s also fundraising for some important initial infrastructure projects, like fixing up their one building. So far, one Brian Lovig, who runs a right wing blog called Right Edition has donated $10,000 to the cause. He is now their Canadian ambassador. There might not be running water or electricity yet, but Jedlicka isn’t worried: they’ll just go off the grid and use renewables. Jedlincka says they’re also talking to HKfree, a libertarian-ish Internet network collective where he used to be CEO, about bringing fast WiFi to the region. Liberlanders aren’t tree-hugging hippies though. They’re going off the grid because there was never a grid to be on in the first place.